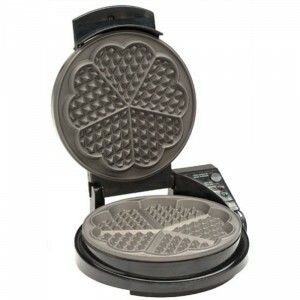 If you have been looking for a waffle maker that you can use to make waffles for the family then this waffle maker is quite ideal for that. This is because it can make five heart-shaped waffles at the same time. You will also love it that the waffle maker allows you to make waffles according to your own preferences in terms of texture, color, and flavor. It will also alert you when the waffles are ready although the beeper tends to be very loud. It takes up very little space when it comes to storage since you can store it in an upright position. It also comes with an in-built cord storage compartment to make storage even easier. You will get to know when the waffles are ready since it comes with a timer that beeps to alert you about this. Since it comes with its own inbuilt timer it will allow you to make waffles that are not overcooked or under cooked. It comes with the Quad Baking System that will allow you to bake heart-shaped waffles that come with different textures, colors, and flavor. You will find it quite ideal to make waffles for the family in a short period of time since it can make five heart-shaped waffles at the same time. It is easy to clean since its baking surface is made of non-stick material. The beeper is quite loud.